Today's guest blog is from Dr. Catherine Lenox, a veterinary nutritionist. She'll be discussing the role of fish oil supplemention in veterinary medicine. Fish oil is a common supplement in both human and veterinary medicine. This blog will discuss what fish oil is and how it can help (or hurt) your patients. The term “fish oil” usually refers to oil containing eicosapentaenoic acid (EPA) and docosahexaenoic acid (DHA) and other fatty acids that comes from fatty fish such as salmon or anchovies. EPA and DHA are omega-3 fatty acids that are long-chain (containing 20 or 22 carbons) and polyunsaturated (containing 2 more double bonds in the hydrocarbon chain). Omega-3 acids differ from omega-6 fatty acids in the sense that the double bonds are in different locations. Both omega-3 and omega-6 fatty acids are essential in the diet of dogs and cats due to an inability to produce these fatty acids from others consumed in the diet. The essential omega-6 fatty acids are linoleic acid (dogs and cats) and arachidonic acid (cats only). 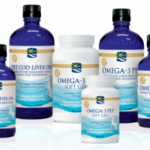 The essential omega-3 fatty acids are alpha-linolenic acid, EPA, and DHA. Animals in different life stages have different requirements for these fatty acids. For example, a reproducing cat requires more arachidonic acid than a spayed or neutered cat, and a developing animal requires more DHA than an older animal. This is due to the different roles played by the fatty acids. Linoleic acid and alpha-linoleic acid are only found in plant-based oils such as corn oil, canola oil, or soybean oil. Arachidonic acid is found in the greatest concentration in animal fats, while EPA and DHA are found in the highest concentrations in fish oil. Fish oil omega-3 fatty acids have been shown to benefit animals with multiple disease processes. Patients with orthopedic disease, cancer, renal disease, skin disease, cardiac disease, and hyperlipidemia have been shown to benefit from EPA and DHA supplementation. These fatty acids have multiple effects when consumed in the appropriate dosages, but the most notable effect is the anti-inflammatory actions (though I like to call it the less “pro-inflammatory effect”) of EPA versus arachidonic acid. There is a competitive effect between EPA and arachidonic acid, and when more EPA is consumed, phospholipids containing EPA replace phospholipids containing arachidonic acid in cell membranes. Phospholipid fatty acids in turn affect production of specific prostaglandins, leukotrienes, and inflammatory cytokines. When EPA is present, these inflammatory mediators tend to be less “pro-inflammatory” than when arachidonic acid is present. The result is reduction in inflammatory conditions including the ones mentioned, reduction of conditions and clinical signs associated with these diseases such as cachexia, and other effects unrelated to inflammation such as reduction in blood trigylcerides. Omega-3 fatty acids can be dosed in different ways and while there is not a consensus on the most appropriate method of dosing, I usually dose them at 40-70 mg EPA+DHA combined per kg body weight for dogs and around 30 mg/kg for cats. The dosages for cats are even less clear than dogs, so using a veterinary product at the labeled dose or less is recommended to avoid adverse effects. The fatty acids can also be dosed at mg EPA+DHA per kg diet or mg EPA+DHA per 100 kcal consumed. These measurements more frequently apply to omega-3 fatty acids added to the food. Because EPA and DHA are long-chain polyunsaturated fatty acids, they can be subject to rancidity quite easily. Therefore one must be careful about storing foods containing omega-3 fatty acids and claims that foods with omega-3 fatty acids are preservative-free (especially if claims are associated with a dry kibble – the storage time is longer). Frequently, foods claiming to contain omega-3 fatty acids will contain some EPA and DHA (from fish oil) and some alpha-linolenic acid (from flaxseed oil or canola oil). It is important to note that all omega-3 fatty acids are not the same. Providing omega-3 fatty acids from flaxseed oil actually does not provide the same benefits as omega-3 fatty acids from fish oil. Alpha-linolenic acid has a very poor conversion rate to EPA (<10% in dogs and almost negligent in cats), therefore it does not provide the anti-inflammatory / less pro-inflammatory benefits listed above. This is not to say that patients don’t benefit at all from flaxseed oil supplementation, but it does not have anti-inflammatory benefits like fish oil dose. I recommend supplementing omega-3 fatty acids from fish oil when the patient can tolerate them (i.e. they can handle a little extra fat in the diet and do not have adverse effects resulting from supplementation), when the diet does not contain sufficient quantities of EPA and DHA, and when the patient has one of the conditions listed above. I use fish oil supplements more commonly in cancer patients, cachectic patients, and patients with protein-losing nephropathies than other conditions, but they have the potential to be beneficial in any patient with inflammatory disease. The last thing we’ll talk about is potential adverse effects of omega-3 fatty acids. Remember that no dietary supplement comes without potential adverse effects – they are just like drugs in that sense. Potential issues with supplementing or over-supplementing include: altered platelet function, gastrointestinal side effects, potential for peroxidation / rancidity, potential for nutrient excess or toxin exposure resulting from poor quality control, altered immune function, altered wound healing, and nutrient-drug interactions. Some of these effects are theoretical in animals, but just a reminder than not all dietary supplements are harmless. Bauer JE. 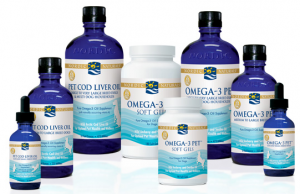 Therapeutic use of fish oils in companion animals. J Am Vet Med Assoc. 2011; 239: 1441-51. Lenox CE and Bauer JE. Potential adverse effects of omega-3 fatty acids in dogs and cats. J Vet Intern Med. 2013; 27: 217-26. It is always a good reminder that while supplements seem like a harmless thing, they can still have adverse side effects. Thank you for the information on when it is a good idea to use fish oil, and when it is smart to abstain from it.